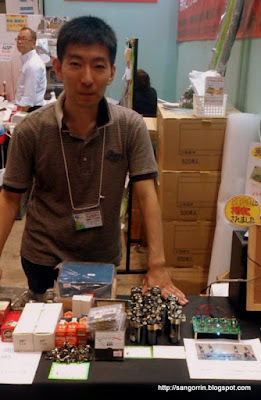 Last August I attended Tokyo's ham fair 2015. Actually it was my second time attending this event, and I was very excited because this time I had my own amateur operator license (see my previous post here). 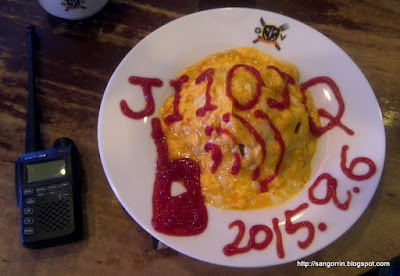 The picture shows my call sign (JI1OJQ) painted with ketchup onto an omurice at a maid bar in Akihabara. This year was also special because a friend of mine had his own booth. My friend sells retro stuff (vacuum valves and the like) at Ikenoya radio in Akihabara's electronic town. Apart from that, I found an interesting radio amateur group of people called yama-to-musen (mountains and radio). Climbing two separate mountains and trying to communicate from the top sounds like fun.